One of the most sought out but also feared Glacier National Park wildlife is the Grizzly Bear. The Grizzly Bear is a subspecies of the Brown Bear. They originated in Europe and Asia but are now also found in western United States and Canada. The main identifying feature of the Grizzly Bear is the hump on their shoulders. This hump is a mass of muscle which gives them their digging strength. They have very long claws on their front feet to assist in digging for food and making their winter dens. 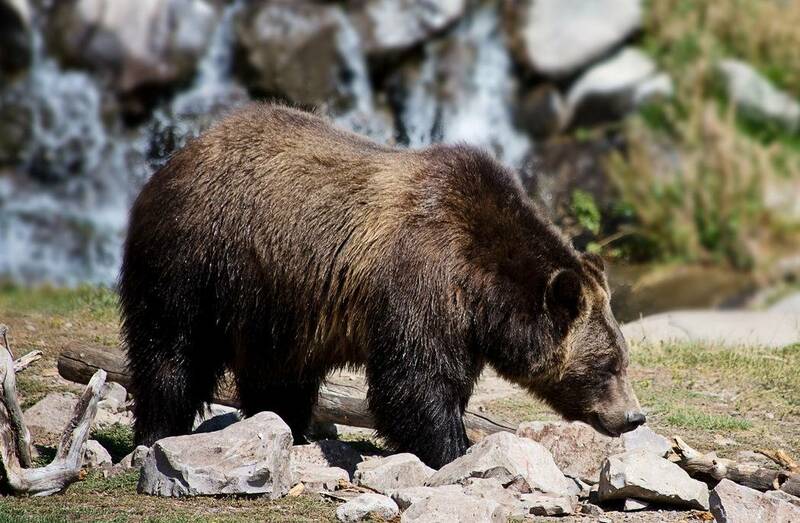 Grizzlies prefer to live along rivers and streams through forests, alpine meadows, and prairies. They range in color from light tan to black. The Grizzly Bear received it’s name because of white tips on their brown fur giving them a “grizzled” look. They typically weigh 350-500 pounds and stand 3-4 feet on all fours and up to 8 ft on their hind feet. Boars (males) can weigh up to 1,700 pounds and sows (females) can weight up to 800 pounds. Grizzly Bears are omnivores meaning they eat both meat and plants. Even though they are a very large animal, 75% of they diet consists of berries. Alternatively, they prey on fish, rodents like ground squirrels, and hoofed animals like moose, elk, and deer. In the fall when they are preparing to hibernate, they will eat up to 25 fish and put on 3 pounds a day until they hibernate for 5 to 8 months. The Grizzly Bear mates in late spring to early summer. When the sow Grizzly becomes pregnant, the embryo doesn’t start developing until they go into hibernation, referred to as “delayed implantation”. If she doesn’t put on enough weight before hibernation, the development of the embryo won’t start. The cubs are born in hibernation and are usually twins, and stay with the sow until they are 2 ½ years old. Grizzly Bears are excellent swimmers and fast runners – up to 30 mph. They have perfect eye sight and have an excellent sense of smell. Although cubs have the ability to climb trees, as they become older and their long claws develop they eventually loose that ability. Grizzly Bears typically live about 25 years in the wild. A recent DNA study determined there are more than 600 Grizzly Bears in Glacier National Park. The biggest distinguishing difference between the Black Bear and the Grizzly Bear is the hump of muscle on the Grizzly Bear’s shoulders. Black Bear are usually smaller – weighing from 110-300 pounds and standing 2 ½ -3 feet on all fours and up to 5 feet on their hind feet. Boars (males) can weigh as much as 600 pounds so size alone is not necessarily a good identifier. Black Bears also range in color from black to light tan. Many of them will have a light patch on their chest with a light colored pointed nose. They can live nearly everywhere but prefer forested areas and are found in Alaska, all of Canada and the US, and even in northern Mexico. Black Bears are also omnivores – plant and meat eating – but prefer roots, berries, insects, grass, and other succulent plants. They are easily attracted to trash and bee hive honey. Once they find these types of food sources, they are considered a nuisance and quite often euthanized. The Black Bear mates in May or June and once the sow (female) becomes pregnant, she has delayed implantation until she hibernates in her den for the winter. The cubs are born in the den – usually twins – and will typically stay with the sow for 1 ½ years before they separate. Unlike the Grizzly, the Black Bear has shorter claws and are very good tree climbers. The average lifespan of a Black Bear is 20 years. Another sought out wildlife species in Glaicer Park is the Mountain Goat. They are not true goats but members of the antelope family. They live in the mountainous regions of Alaska and western Canada and United States. You’ll typically find them above the tree line, many times on steep craggy surfaces. In the winter, they will migrate to lower elevations to find mineral licks. between 100 and 180 pounds. Billies can weigh up to 310 pounds. They have cloven feet with 2 toes and rough pads which provide them with natural climbing soles. The tips of their feet have sharp dewclaws which keep them from slipping on rock ledges. Most of the time, nannies live in herds of up to 20 with their offspring. Billies usually live alone. The Mountain Goat’s diet consists of grasses, sedges, herbs, shrubs, ferns mosses and lichen. They will also eat twigs and leaves from the low-growing shrubs and conifers. They mate in November or December with the birth of the “kids” in May or June, typically single births versus twins. The kids will stay with the nanny until the next mating season. Mountain Goats usually live 12-15 years in the wild. The Rocky Mountain Bighorn Sheep is another Park wildlife which attracts a lot of attention. They range in color from grayish dark brown to light brown with white on the rump, muzzle, and backs of their legs. They get their name from the large, curved horns the rams (males) have, weighing up to pounds. The ewes (females) also have horns but they are not as long, or curved. Typical weight of the Rocky Mountain Bighorn Sheep is 110 pounds to 280 pounds however rams have been known to exceed 500 pounds. Their split hooves with rough bottoms aide in balance and grip in their steep, rocky, rugged mountain terrain. They inhabit the high mountainous regions of the United States and Canada. In the winter, they migrate to pastures in lower elevations. The Rocky Mountain Bighorn Sheep live in social groups with rams living in bachelor groups and ewes living in herds with other ewes and young rams. Their diet consists of available grasses, seeds, and plants. Mating occurs in November or December with the lambs being born in May or June on high, secluded ledges. It is usually a single birth with twins being rare. The lifespan of a Rocky Mountain Bighorn Sheep is 9-14 years. Of all the bighorn sheep, the Rocky Mountain Bighorn Sheep is the largest and most majestic. One of our favorite Glacier National Park wildlife species is the Moose. Moose are the largest member of the deer family. From hoof to shoulder they stand from 5 to 6 ½ feet tall. They range from light brown to dark brown in color. Identifying features are a long, rounded snout, large flattened antlers up to 6 feet wide weighing 50-60 pounds, hump back over the shoulders, thin legs, massive body, and large ears that can rotate to give them stereophonic hearing. Their eye sight is poor but their sense of smell and hearing is very good. Even though bulls (males) and cows (females) are nearly the same height, bulls will weigh 800 to 1300 pounds while cows weigh 600 to 875 pounds. The knees in their thin legs are double jointed and when they run they appear quite uncoordinated but they are actually very agile both on land and in water. They can run up to 35 miles per hours and can swim 6 miles per hour for 2 hours. 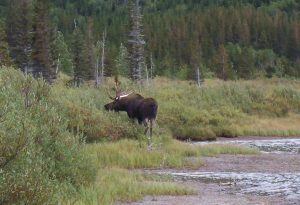 Moose are herbivores – plant eating. Their height makes if difficult for them to bend down to eat grasses, so they prefer to feed on leaves, bark, and twigs from trees and shrubs. Many times you can find them standing in ponds munching on aquatic plants. Because of their thick fur, they like to live in northern colder climates near forested streams and ponds. They live across the northern part of the US, all of Canada, and Alaska. The bulls start growing their antlers in the spring. Each spring when they re-grow their antlers, they will get larger and bulls with more mature antlers will usually get to mate with the cows. The main purpose for growing the antlers is for mating season in the fall. A bull competing for a cow will fight off other bulls with their antlers. After mating season, the bulls will loose their antlers. Moose are solitary animals and only socialize during mating season. Cows give birth to one calf which is able to stand up on it’s own on the first day. Calves will stay with the cows for one year until she gives birth to another calf. Calves reach adulthood in 4-6 years. Only 50% of the calves reach adulthood due to bear and wolf attacks. Once they reach adulthood, typical life span for a Moose is 12-20 years. Rocky Mountain Elk, also known as Wapiti (a Shawnee term for white rump), is another large member of the deer family. They are grayish brown in color with a white rump and darker brown legs and neck. Bull (male) antlers can reach 4 feet above their heads, 7 feet long, and can weigh up to 40 pounds. Bulls can weigh up to 1000 pounds while cows will weigh about 500 pounds. Rocky Mountain Elk are herbivores, eating mostly grasses in the summer and adding sprouts and branches of shrubs and trees in the fall and winter. They are mostly found in the productive grassland regions of the Rocky Mountains. Introductions to other areas of the US has made it possible for them to be found in many other states. Cows (females), calves, and yearlings live in herds while bulls live in bachelor herds or solitary. In the fall, bulls gather cows and calves into small groups called harems. Bulls cover themselves with “perfume” by wallowing in mud or rubbing on trees and bugle to attract the cows. They guard their harem very aggressively and will fight off other bulls using their antlers, sometimes to the death. After the rut (mating season), bulls will shed their antlers, which grow back each spring. The more mature a bull is, the larger his antlers are. Cows give birth to to one calf in late May or early June. They will leave the herd just before they give birth to protect the calf from predators. Calves are born spotted and scentless to camouflage them from predators. Once they are able to out run predators – at about 2 weeks of age – they will re-join the herd and stay with their mother for about 1 ½ years. Rocky Mountain Elk will live in the wild to be 12-20 years old. Whitetail deer, the smallest of the deer family, gets it’s name from the underside of it’s bushy 6-11 inch long tail which is erected when they detect danger. They are a reddish brown in the spring and summer and fade to a grayish brown in the fall and winter. Whitetail deer also have white fur around their eyes, nose, part of their throat, and the underside of their bellies. They have long slender legs with pointy hooves and prominent ears. They have horizontally slit pupils which give them excellent night vision and color vision during the day. Bucks (males) have antlers which may or may not be symmetrical. Their antlers grow points off a main stem. Typically the size and number of points indicates the maturity of the buck but it is possible for a yearling buck to have large antlers if they have a good source of food. It is also possible for a mature buck to have just a spike. Bucks typically weigh between 120-300 pounds but some have been recorded to weigh over 400 pounds. The doe (females) will typically weigh between 90 and 200 pounds. Adults, bucks and does, stand about 39 inches tall at the shoulders. They are the most widespread of the deer family and can be found across most of the US, Canada, and Mexico. They can also be found in many countries around the world as they adapt very easily to whatever environment is available for them. However, the larger Whitetail Deer are found in the more temperate climates of the US and Canada like the northern Rocky Mountain region, the Dakotas, and northern Minnesota. Whitetail deer are herbivores and their diet changes depending on habitat and season. They eat green plants in the spring and summer. In the fall, they eat corn, acorns and other nuts. In the winter, they eat the buds and twigs of woody plants. They like to live in small openings and on edges of forested areas or in fields with broad-leaf trees for cover. During the summer, Whitetail Deer live in family groups of related females, fawns (babies), and yearlings. Bucks live solitary or in small bachelor groups. The bucks and does come together during the rut (mating season) in the fall. Bucks will mate with as many does as they have stamina for. They will compete for the does and will fight off other bucks with their hooves or antlers. After the rut, males will loose their antlers which regrow each spring. Does will give birth to 1-3 fawns in late May or early June. The fawns are reddish brown with spots and odorless to protect them from predators. Female fawns will stay with the doe for up to 2 years but male fawns will venture out on their own after the first year. The Whitetail Deer can run at speeds up to 30 miles per hour. They are excellent leapers, as high as 10 feet and as far as 30 feet, and very good swimmers. Average life span for a Whitetail deer is 6 to 14 years. Mule Deer get their name from their large ears, like that of a mule. The biggest differences between a Mule Deer and a Whitetail Deer is their larger ears, smaller tails (only 5-8 inches long) and all white with a black tip, and antlers that fork as they grow rather than points coming off a main stem. They are also a bit larger with the bucks weighing 150-330 pounds, standing up to 42 inches at the shoulders while does weigh between 100-200 pounds. Mule Deer are tannish brown in the summer and turn to grayish brown in the winter. They have a black forehead with a light gray face. Their range is mostly west of the Missouri River especially in the Rocky Mountains. Mule Deer live in higher elevations during the summer and move to lower elevations during the winter months where more food sources are available. Mule Deer are herbivores eating mostly weeds and leaves and twigs of woody shrubs. In the fall, the rut begins and mature bucks will compete for the right to mate with the does. They will lock antlers and fight to the point of exhaustion, until one backs away. A mature doe will usually give birth to twin fawns. Young does will only give birth to a single fawn. Fawns are born with spots and odorless to protect them from predators. The doe will keep the fawn hidden for up to 10 days or until the fawn is strong enough to follow the doe. Fawns stay with their mother for one year. When Mule Deer are alarmed, they don’t run, they use a motion called slotting. Slotting is when they bound, pushing off the ground with all 4 hooves at the same time. With each bound, they can jump as high as 2 feet and as far as 15 feet. Mule Deer are not a fast as Whitetail Deer but they are more effective with their escape in rugged terrain. The life span of a Mule Deer is 9-11 years.